From suction rate to noise power level: This page provides you with explanations of the most important technical terms all about the topic of compressed air technology. 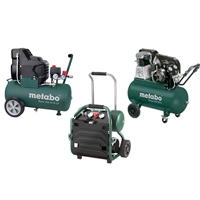 The suction rate is the theoretical air volume in litres that the compressor draws in per minute. 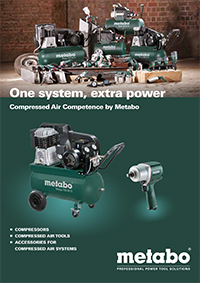 However, the effective air volume is relevant for selecting the right compressor. The filling capacity is the calculated air volume in litres that the compressor discharges per minute. Using this value you can easily compare the different compressors and thus find the ideal compressor for your application. The free air delivery is the most important value. It can be compared with the filling capacity, however it is the actually measured air volume that the compressor discharges per minute. Using this value you can easily compare the different compressors and thus find the ideal compressor for your application. The sound pressure level is the relevant noise value for the assessment of occupational safety and health protection within the occupational health and safety regulation. The sound power level, on the other hand, is the noise value that is relevant to statutory limit values - above all in outdoor areas (see outdoor noise directive). The working pressure is set at the (filter) pressure regulator and is the pressure with which the tool is to be operated in working mode. 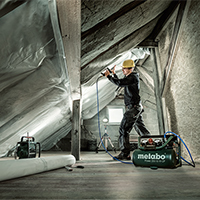 Metabo compressors are always equipped with two manometers: The manometer at the pressure switch indicates the container pressure, the manometer at the (filter) pressure regulator indicates the working pressure. It should always be set to the working pressure of the tool. Important: The tool should be in operation when the setting is carried out in order to have the actual working pressure displayed. 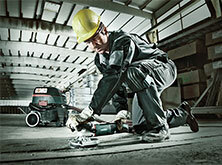 Depending on the tool you are working with, you require oiled or non-oiled compressed air. Kindly keep in mind that it is important to regularly oil rotating tools and tools with impact mechanisms - follow the operating instructions. 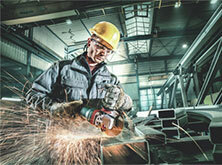 Ideally, use a mist oiler, which constantly discharges a fine oil mist into the compressed air. On the other hand, other tools, such as paint spray guns or tyre inflating devices require oil-free compressed air. Special filters should be used for this. Details can be found in the operating instructions of your compressed air tool or in DIN ISO 8573-1. The specific requirement of compressed air is the air volume required for compressed air applications. This y-value is the minimum effective air volume your compressor has to deliver. Only this guarantees that sufficient compressed air is available over a long period of time.